Every child is influenced by the entertainment they are shown. I am fortunate in that I saw many Disney movies as a child. I do not like every Disney movie out there, but most of them are hard to dislike. After all, Walt Disney was not in the habit of writing trash. He was one of those rare entertainers who earned money as a reward for telling a good story, not telling any old story just to make a dollar. *Sigh. * We could use a few more storytellers like that these days! This entry was posted in Movie Reviews, Music Reviews and tagged Aladdin, Animated films, Brave, Disney, Disney films, Disney movies, Disney Princesses, Disney songs, Disney/Pixar, Disney/Pixar films, Hayao Miyazaki, Movie Reviews, Mulan, Music Reviews, Robin Hood, singing, Snow White and the Seven Dwarfs, song, songs, The Jungle Book, The Lion King II: Simba’s Pride, The Secret World of Arietty, Walt Disney on September 1, 2017 by The Mithril Guardian. Generally, when I find a film based on a book, I try to read the book as well as watch the film. This is what I did when I learned that Howl’s Moving Castle began life as a novel; I read the book. Sometimes I enjoy the book and film equally, while at other times I enjoy the book more than the film. This is the case with the Hunger Games trilogy. The cinematographers for the films did not do the books true justice on a number of levels – and there was no need to make Mockingjay into two films. No need at all. There are times, however, when I prefer what I see to what can be read. In the case of the Horatio Hornblower television series, this is what happened. Though I may someday read the books, I think that I will probably always enjoy the TV series over the novels. I first saw the Hornblower series when it aired on PBS’ Masterpiece Theater. I do not remember how old I was. I know I was young enough not to understand some of what was said or implied in certain cases. There is nothing wrong with that, of course; I enjoyed the adventure and got the gist of the important dialogue. For a child, it is enough. The novels starring Horatio Hornblower were written by C. S. Forester in the 1930s and possibly into perhaps the 1950s. They star the fictional hero Horatio Hornblower, a young captain in His Majesty’s navy. Forester eventually worked back from Hornblower’s position as captain to show how he rose through the ranks, and this is where the television series starts. 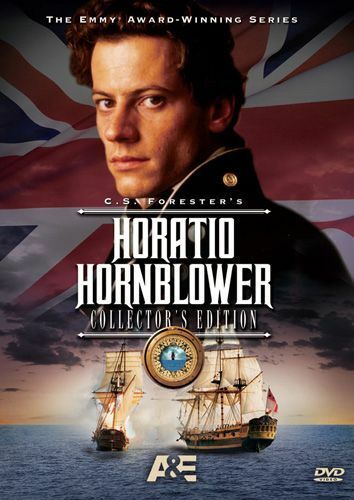 In the late 1700s, after America has won her independence from Great Britain, Horatio Hornblower becomes a midshipman aboard His Majesty’s ship, the Justinian, in order to pay a debt that his father owes. The captain of the Justinian is a friend of Dr. Hornblower, and so he accepts Horatio as a midshipman with facility. The day he gets aboard the Justinian is a wet, grey day. Having never been aboard a ship before, Horatio has a little trouble holding down his dinner and throws up when he is introduced to the other midshipmen aboard the vessel. 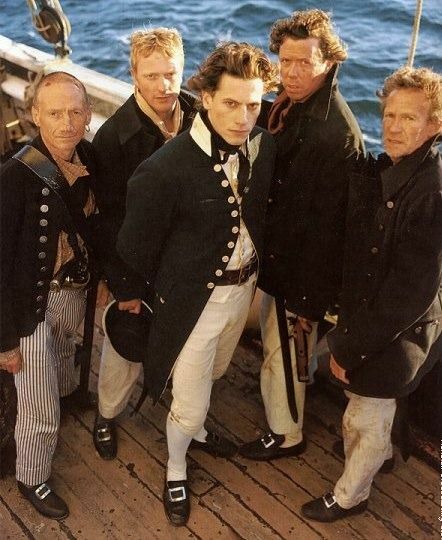 Two of these – an older man named Clayton and a man about his own age, Midshipman Archie Kennedy (Jamie Bamber) – soon become fast friends with the seventeen year old Hornblower. Aside from this incident, Hornblower finds the world of the navy to be pretty decent. At least until the most senior midshipman, a bully named Jack Simpson, returns to the Justinian. Simpson is about thirty and still a midshipman; at the time, a midshipman could start out as young as eleven. The senior officers tutored the midshipmen in the arts of seamanship, tactics, and navigation until they could earn the rank of lieutenant. Unfortunately, Simpson is as dumb as a stump when it comes to mathematics. He could not navigate a bathtub, let alone the oceans. Worse, he is a bully and a coward, and he takes out his frustration at being forever a midshipman on the other, younger midshipmen, who are all terrified of him. All except for the new midshipman. Hornblower is not afraid to stand up to Simpson, which is bad enough. But when he also proves to be far and away the best at mathematics aboard the Justinian, Simpson turns up the heat on him. Life aboard ship becomes almost intolerable, and when Simpson insults Hornblower during a card game, the young midshipman decides to try and rid both the ship and the navy of this scourge by challenging him to a duel. His challenge shames Clayton who, knowing Hornblower will lose the match, knocks him out and takes his place. Though he wings Simpson, Clayton himself is badly injured and dies of his wounds not long after. The day he dies is also the day King Louis XVI is beheaded in France, leading England into war with the French Republic. This leads Hornblower, Archie, and the other Midshipmen to be transferred to His Majesty’s ship, Indefatigable. The Indefatigable was a real ship, commanded by the real Sir Edmund Pellew, the captain of the frigate within the film series and the books (played by Robert Lindsey to perfection in the TV series). Pellew tells Hornblower in no uncertain terms that he does not think much of a man who lets others fight his battles for him, before ordering him to take part in no more duels while he is aboard the Indefatigable, or “the Indy,” as the crew calls her. In the meantime Hornblower is given command of Simpson’s division from the Justinian. This division crew consists of Styles (Sean Gilder), a brawler who tends to leap into fights at the first opportunity; Matthews (Paul Copley), an experienced seaman and the senior member of the group; Finch, a small man who is at least as old and seasoned as Matthews, and young Oldroyd. Hornblower finds the crew chasing down rats in the hold and betting on Styles’ ability to kill them. Styles doesn’t do this with his hands but with his teeth; his hands are tied behind him and he has to catch and kill the rats with his mouth. This sort of sport is not allowed aboard ship, of course, and Hornblower makes it clear that while he commands their division, Matthews, Styles, and the rest will not play these games anymore. Not long after this the Indy captures her first French prize, but Hornblower is not above deck for the engagement because a member of his division is injured in the fight and he helps take the man down to sickbay. He later distinguishes himself in battle, after a fashion, earning Pellew’s interest. But Hornblower’s happiness aboard the Indy is dimmed when, coming to the rescue of a sinking British ship, he himself ends up helping a bedraggled Simpson to safety. There are eight episodes in the Hornblower series. 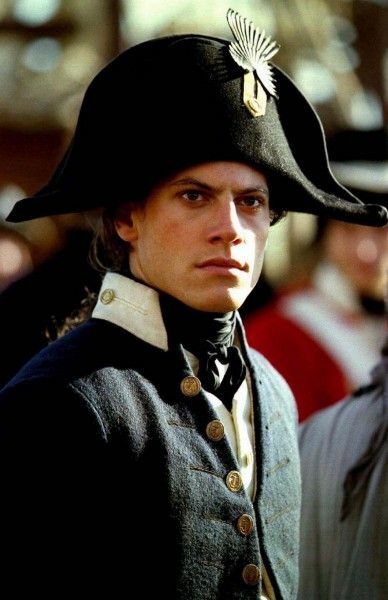 Starring Ioan Gruffudd as Horatio Hornblower, this was my first introduction to the actor. Later, when he was tapped to play Mr. Fantastic in the Fantastic Four films, the first words out of my mouth on seeing him were, “That’s Hornblower!” And so it has remained. Whether he appears in 102 Dalmatians or the latest remake of The Jungle Book, the first words I say on seeing him are, “There’s Hornblower!” It is lucky for me that he loves the character so much! This entry was posted in TV Shows and tagged 102 Dalmatians, 1930s, 1950s, books, books about sailing, books about the navy, Britain, C. S. Forester, duels, England, Fantastic Four films, Finch, France, H. M. S. Indefatigable, H. M. S. Justinian, Horatio Hornblower, Howl's Moving Castle, Indefatigable, Ioan Gruffudd, Jack Simpson, Jamie Bamber, Justinian, King Louis XVI, Master Piece Theater, Matthews, midshipman, Midshipman Archie Kennedy, Mockingjay, Mr. Fantastic/Reed Richards, navies, navy, old books, Oldroyd, Paul Copley, PBS, rats, Robert Lindsey, sailing, sailors, Sean Gilder, Sir Edmund Pellew, Styles, Suzanne Collins, The Duel, The Even Chance, The Hunger Games Trilogy, The Jungle Book, TV, TV series, TV Shows, wooden sailing ships, wooden ships and iron men on April 28, 2017 by The Mithril Guardian.